My sister-in-law brought us a bunch of quick Nuss Schinklis when they were on sale—it's a good thing to keep in the fridge for a Sunday dinner. Merci Fränzi! Schinken im Teig just means ham in dough. The Swiss love wrapping their meat in dough, whether it be a light, flaky pastry or a thick, chewy bread crust. 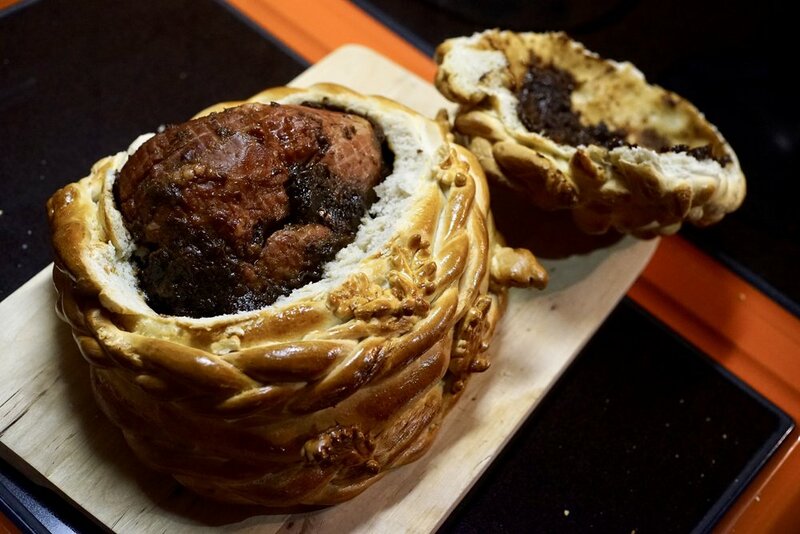 Sometimes the pork is first studded with dried fruit and carefully wrapped with bacon. This impressive, golden encrusted meat is often served for special occasions or Sunday dinner. 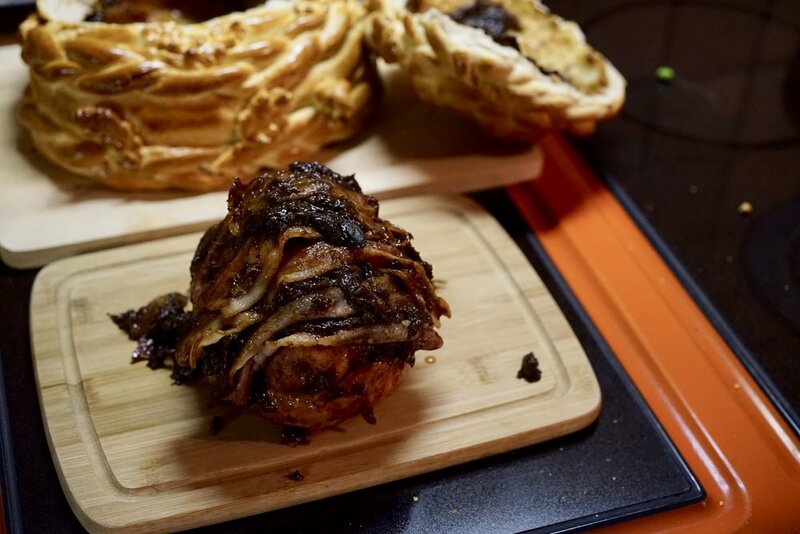 Although you can use many different cuts of pork to make similar dishes (see my post on my mother-in-law's pork tenderloin wrapped in puff pastry), this version uses the Nuss, a cut of pork from the rump of a pig. It's often sold in a clearly labelled bag (see above), already cured, so just needs warming before you can eat it. This is particularly convenient because I struggle with the different names of different cuts of meat, and I'm sometimes not sure exactly what I'm getting. In an attempt to wade through some of the confusion, I have written this post on Swiss (German) Cuts of Pork to clear up some of the mystery (and to go with my earlier post on Swiss (German) Cuts of Beef). 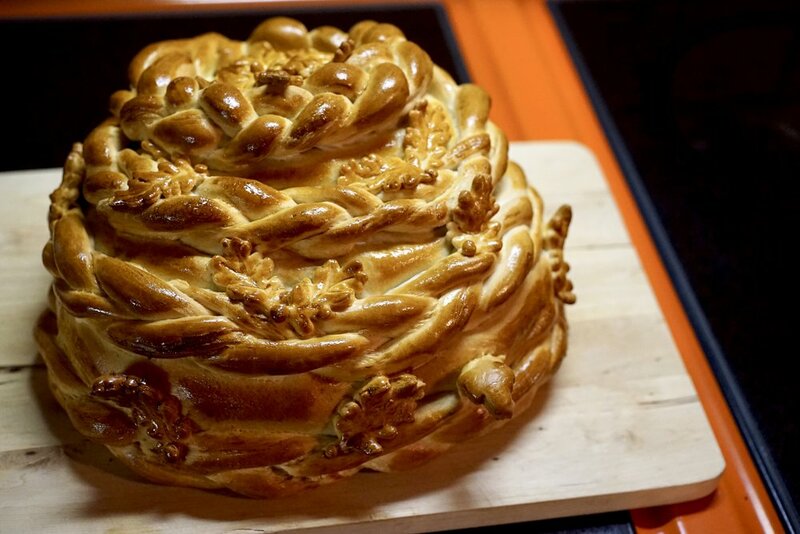 The crust here is a simple bread dough, which takes a little time, but tastes delicious and lends itself well to decorating. Schinken im Teig is a relatively easy and definitely delicious meal. The meat is tender, the crust is, well, crusty and it normally comes out perfectly every time. In a stand mixer with a dough hook, mix together the flour, salt, and yeast. 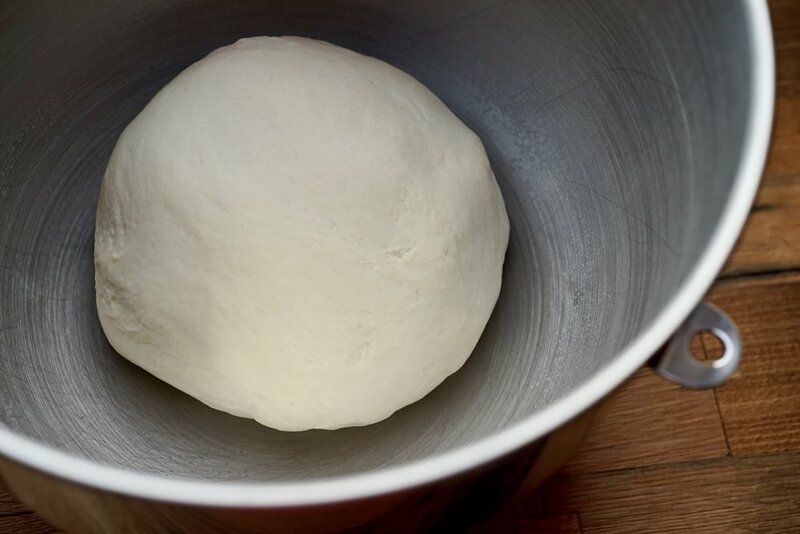 Add the water and oil, and mix on medium speed until it forms a smooth, stretchy dough—about ten minutes. Alternatively, knead by hand for about 20-25 minutes. Let rise until doubled, about 90 minutes. In the meantime, you want to make a paste with your prunes. Put them in a food processor or use an immersion blender, adding some warm water to smooth them out. Once they are mostly blended (they can still have some coarse parts), stir in the Dijon. Once the dough has risen, split off a little piece and set this aside for decorations (this is optional). Roll the rest of the dough out into a circle big enough to fit the meat. 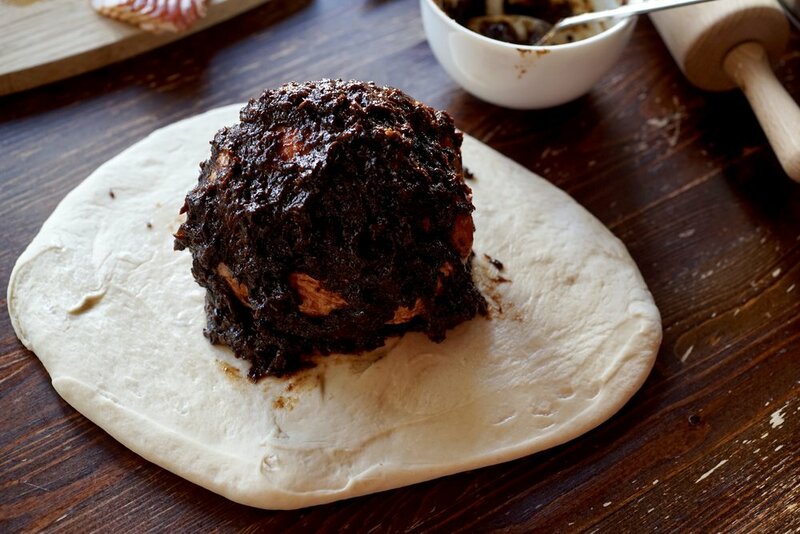 Spread a little prune paste on the dough then set the meat on top. Spread the rest of the paste on the meat, then cover with bacon. Use the egg white to brush the edges of the dough and then seal the ball of meat inside. Now, if desired, you can decorate the dough. 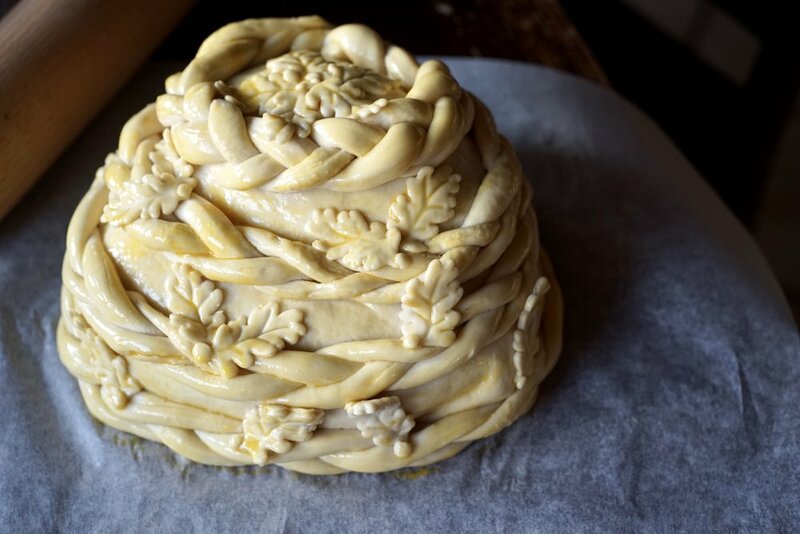 You can make braids with the dough, or use cookie cutters to make shapes (or both). You can use the egg white to help stick the decorations onto the dough. Once you have finished decorating, brush the dough with the egg yolk. Bake for about 60 minutes, or until the outside is golden brown. To serve, you can either cut slices of the meat and bread together, or you can cut a hole in the top of the bread and take out the meat, cutting both separately. If you don't feel like making the prune purèe, it can be left out, or replaced with whole dried prunes or other fruit. Be sure to remove the net that is sometimes covering the meat, before you place it in the dough. I recommend taking the meat out of the bread to serve so you can better control the ration of meat to bread. If you cut it directly, the first few slices are almost entirely bread.